As I probably mentioned before, we booked a private tour with fellow passengers on Cruise Critic several months ago. It was a photography tour, not that you had to be a photographer, but the plan was to spend 5 and a half hours going to the most scenic places at the best times for spectacular photos. We were meeting the other 6 passengers at Baristas on deck 5- the coffee bar. At breakfast, the ship was definitely tilting one way, and we could see the shore, so we assumed that the stabilizers were off in preparation for docking at the port. As we prepared to meet our group, Norm said “we have turned away from the port”. We were scheduled to dock at 8 and it was already just past 8. Sure enough within a few minutes, the captain came on the speaker and announced that the pilot had come on board, but due to wind of 40 knots, the port was closed and we were back at sea on our way to Nuku Hiva, French Polynesia, now 5 days at sea away. So, a revised schedule of activities was prepared and we are enjoying a day at sea. Seas are not too rough and the sun is beautiful. Disappointing but not much you can control. We hadn’t been to this island before. So a bit about what we were going to do. Kauai is called the Garden Island and is a tropical paradise with rainforests, waterfalls and some of the most beautiful beaches in the world, they say…my comments will need to wait till next time! It is the oldest and northernmost island in the Hawaiian chain. We were particularly looking forward to seeing Waimea Canyon, known as the Grand Canyon of the Pacific. 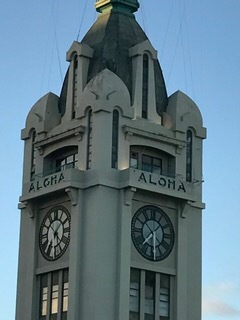 Many movies were filmed here including Blue Hawaii, Diamond Head and Jurassic Park. Parts of the island are only accessible by boat or helicopter. 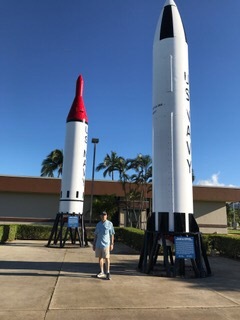 Torpedoes… Norm included for scale. These babies are huge. Many Japanese Americans in Hawaii were fiercely loyal to the US and enlisted in the armed forces. Because it was feared that they would be mistaken for the enemy, they were sent to fight in Europe and their regiment became one of the most decorated in the war. There is a fairly large Chinatown here and our guide said not to to ever go here at night. After about 3 PM stores close and the area is overrun with crime and as she put it “sidewalk stewardesses” – a term for prostitutes that I have never heard before. Real estate is expensive on this island. A modest apartment sells for an average of $719,000 while the average income is $54,000. Real estate is much less expensive on the other islands but there is little work there. Good for retired people, she says. In the Cemetery of the Pacific, the Punch bowl, there are small religious symbols on the stones. There are 64 different religions represented. The stones are laid flat to make it easy to maintain the beauty of the place. The stones that are together are brothers. 38 sets of brothers were at Pearl Harbor and 23 sets of them died. One of the brothers of the remaining pairs died as well and only one full set survived. Honolulu has the largest outdoor shopping center in America- 300 stores. We didn’t go there! On purpose. 953,000 people live here and it has the 3rd worst traffic in America. We were glad it was Saturday. It can take 2 1/2 hours to travel 20 miles. 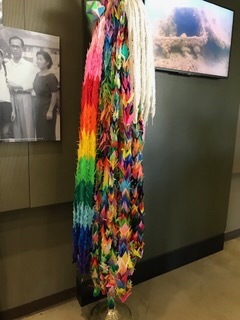 These cranes were made by a 12 year old girl to commemorate peace after the atomic bomb. They became a worldwide symbol of peace. Tonight we are having dinner in the Italian restaurant, Toscana, and will have Jade Milian and Samuel E at the show performing the music of Whitney Houston. We heard them on our previous cruise and really enjoyed the show. Lots of things to do on sea days and we have several dinner plans with friends. Meeting new people who boarded yesterday as well. so sorry you didnt get to see this beautiful island,,, you just have to go on another world cruise and hit it again…. sorry your plans changed but happy that you are enjoying the trip….love to hear about the history of each location. Looking forward to next blog..stay well. So sorry you didn’t get to see the amazing sites of the Island. As you say, next time! The best laid plans…sorry that didn’t’ work as expected. 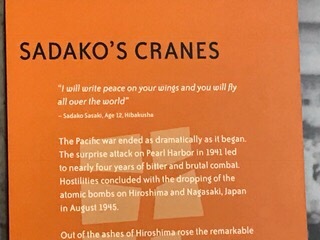 There is a beautifully illustrated book on the story of Sadako’s cranes.